Dareboost has just added Norway to its list of available locations to test your website performance. Indeed, Oslo is the 13th city across the world – the 5th on the European continent – to host our test probes. 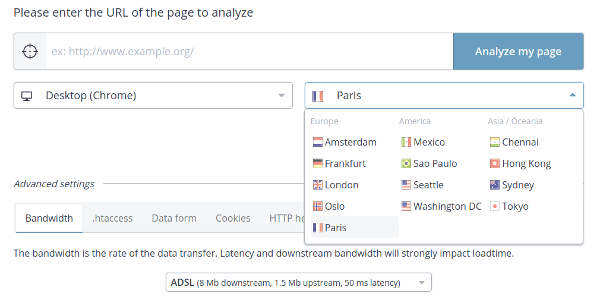 After Mexico (Mexico), Amsterdam (Netherland), São Paulo (Brazil) and Seattle (USA) – among our latest additions – it’s now up to Oslo (Norway) to extend our location list from where you can test your web pages speed. Actually it is the 13th Dareboost testing spot across the world – as the fifth on the European continent – that will give you the opportunity to set up your tests with the most similar browsing conditions to your Scandinavian users. As usual, we invite you to have a look at our web page dedicated to the Dareboost probes locations. There you’ll get an up-to-date list of our testing locations, but also all the IP Addresses related to our probes, in case you may need to set up any authorizations to access your website. As a reminder, all of our probes are associated with a domain complying to the *.probe.dareboost.com pattern. Obviously, we recommend that you add these domains to your infrastructure’s whitelist. That way, you will support any of our upcoming test probes as well. Why does Dareboost propose such a list of locations for your web performance tests? Because your user’s location is one of the factors that may significantly impact their perception of your website speed. Indeed, we previously detailed the reasons why you have to test your website speed like your users browse it, and location is definitely one of these reasons – if you are targeting an international traffic of course! These comparison results seem to achieve an obvious goal for the famous german car brand: make sure its Norwegian web pages are displayed faster for users based in Norway than from anywhere else (at least from the USA as shown in this comparison test). Although these results are punctual (keep in mind that web performance never stops evolving and has to be regularly monitored), we can still note that all the speed indicators measured by Dareboost get better values on the test lead from Oslo. To start with Time to first byte (TTFB): 216ms from Oslo against 298ms from Seattle. Actually, that 82ms difference means a significant speed gap for this fundamental web performance indicator: 27% faster! Our comparison test shows similar gaps for all the others metrics, from the Start Render (1,76s gap) to the fully loaded time (-4,1s) and even the Speed Index, the most UX oriented web performance indicator (computing the average rendering speed as it is perceived by the users): 3245ms from Oslo against 4955ms from Seattle. If a significant part of your website traffic comes from North Europe, This example should motivate you to test your web pages speed with our Norwegian probe right now… and also implement this new testing location within your own web performance monitoring strategy! Naturally, our probe based in Oslo can be used with all the Dareboost features: web performance tests, comparisons, synthetic monitoring and user journey monitoring.